Relax before bed with these DIY shower melts made without citric acid. They are easy to make, and the essential oils can promote healthy sleep. A few weeks ago, I made DIY wake up shower fizzies with essential oils with a blend of oils that help wake you up and make you more alert. Today, I have a slightly different recipe. 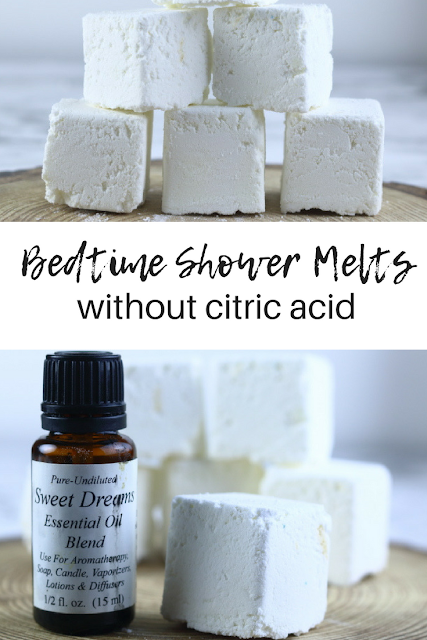 This DIY shower melt is made without citric acid, and I made it with a bedtime blend to help you relax. My daughter loves making bath bombs, but we hadn't made shower melts until recently. They are basically the same thing and made with the same ingredients, but they have more essential oils since you aren't soaking in them. I wanted to make this recipe without citric acid not only to give you options, but also so I could see the difference between the two recipes myself. Both recipes are similar and have the same ingredients except for the citric acid, which I didn't use in this recipe. Citric acid can be fickle to work with. It reacts with water and gives bath bombs and shower fizzies their fizz, but it's very dependent upon the humidity in the air. I've actually had my air off the last few weeks because it's been cool, so my house is humid. This affects the citric acid and makes it fizz more. This recipe without citric acid is also a little easier because there's one less ingredient. I keep citric acid on hand because I make bath bombs and shower fizzies (I also use it for canning), but most people don't keep it on the shelf. Since you don't need it for this recipe, you might like this recipe. One thing to note is that these shower steamers seemed more brittle than the ones made with citric acid. I made several cubes, but most fell apart on the corners. That's fine if you're making them for yourself, but if you plan to give them as gifts or sell them, I would recommend making them with citric acid. I would also be careful storing these. I put them in a plastic food storage container with a lid so they wouldn't get smashed in the cupboard. My kids take showers and not baths, so I wanted a bedtime blend to help promote better sleep. You can certainly change the essential oils; just use the same amount. Speaking of essential oils, this shower melt recipe has a higher concentration of oils than would a bath bomb, so don't use it in the bath. More oils won't hurt you in the shower because you're not resting in the water, but it could lead to irritation if you use these in the bath. I have an entire post devoted to the best essential oils for sleep. I have a kid who doesn't sleep. We're actually starting a new sleep promoting technique this week. You can try one of these essential oils by themselves or create a blend to promote better sleep. You can change the essential oils in this recipe to make your own custom shower melt recipe. Try a calming blend, a wake up blend, or a happiness blend for your own custom recipe. Just use the same amount of oils to keep the ratio the same. You can make this recipe with either one. It's possible that mine were crumbly because of the arrowroot powder. Personally, I don't use cornstarch. Most cornstarch is made with GMO corn, but the plant that arrowroot comes from is never genetically modified. I prefer to use arrowroot, and I also use arrowroot in other recipes, so I always have it on the shelf. I prefer to use a silicone mold for shower melts because I think they release easier. You can use any mold, but one with a design on it may not transfer to the shower melt. I use this 1.25" cube mold. It can go in the dishwasher, but mine retains the scent of the oils after I wash it. It doesn't affect the recipe the next time I use it, but mine are dedicated to bath and body recipes and not food now. Combine the baking soda and cornstarch or arrowroot powder in a bowl. Slowly add the water a tablespoon at a time and stir. I used my hands to really work the water in. It should hold its shape. You might need a little more or less water, depending on the humidity. Spoon into a silicone mold. Press it down to really pack it in there. This is a messy step. I did it over a cutting board so I could wipe it off easily. Let dry for at least 24 hours. Carefully take the shower melts out of the mold and make sure they are completely dry. Then store in a mason jar or other container with a lid. Put one on the bottom of the shower, away from where the water will hit it. The water will melt it, and it will slowly release the essential oils for an aromatherapy shower. I would consider this a fairly easy DIY bath recipe, but it is messy. If you'd rather not DIY this one, you can get them premade on Etsy or Amazon.